In the first attempt to actually quantify the environmental damage done by BP'sDeepwater Horizon disaster, scientists writing in the Science journal found $17.2 billion worth of damages to the Gulf of Mexico caused by the 2010 well blowout the spewed crude into the Gulf for 87 days before it was capped. An estimated 134 million gallons of crude spoiled the waters and coastline, killing an unknown number of birds, fish and marine mammals. The figure is slightly less than the $20 billion settlement reached between BP and government authorities and approved by the court last year. 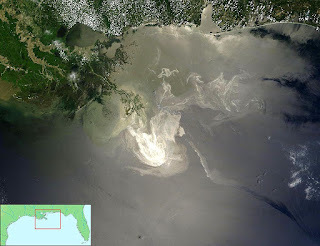 BP was found to be grossly negligent in its operations, engaged in willful misconduct, and mostly responsible for the largest spill disaster in US history (67%). The damage figure was arrived at by a team of researchers retained by NOAA who randomly surveyed a large sample of American adults that took three years to complete. Based on the survey, researchers found that the average household was willing to spend $153 to insure 100% spill-free operations in the future. That figure was extrapolated to reach the final figure of $17.2 billion. Researchers considered the individual contribution size to be "eye-opening", but an accurate indication of how valuable a clean environment is to Americans.